You are currently browsing the tag archive for the ‘Dynamics CRM’ tag. After the relatively recent acquisition of FieldOne by Microsoft, the solution is now available to be installed on a new trial of Dynamics CRM Online 2015 Update 1. The friendliness of the UI and the ability to provide drag and drop on a scheduling board makes using this product very easy and intuitive. Coupled with a powerful back engine to validate and recalculate schedules, this is an ideal solution for field service. Add to that extensive support for mobile, and you have a complete end to end package for managing resources in the field. The amount of business insight that can be gained using this solution is of great value. 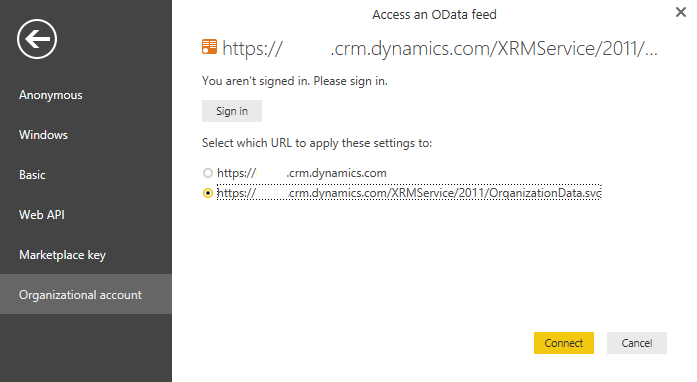 Starting with a real-time view into the performance of your business and field service, analyzing of large amounts of data to determine patterns and issues with standard scheduling as well as extensive reporting capabilities for operations analysis and strategy, this solution is a great add-on to the Dynamics CRM family. The process to add the FieldOne solution is the same as adding the previously available Insights and Office 365 Groups solution. 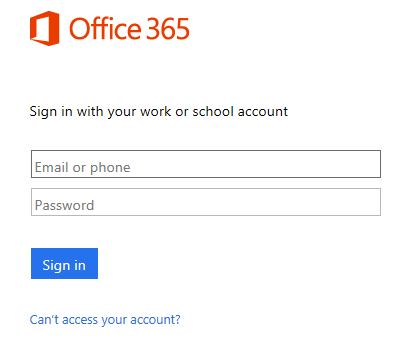 From the Office 365 portal navigate to CRM. In the Manage all CRM Online instances select the trial instance or the one you want the solution added to. Click on Solutions. On the next screen select the FieldOne Sky solution and click Install. Note that the installation will take a short while. Once the solution is installed, navigate to your CRM instance and validate that FieldOne Sky is installed. If your standard navigation is not customized, you can do that by looking for a new tab added to the top navigation and named FieldOne Sky. 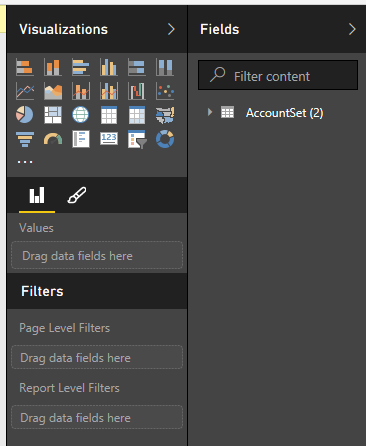 Following THIS previous post where I described how to connect Power BI Desktop to Dynamics CRM, we’re going to have a quick look at how to map our Accounts from Dynamics CRM in Power BI. 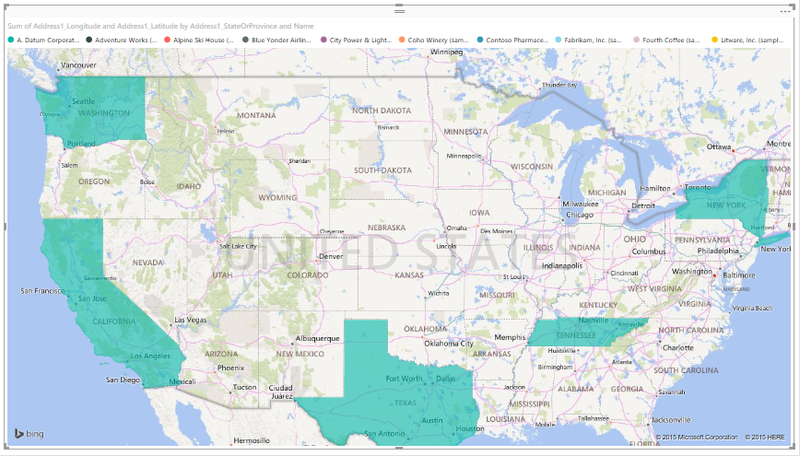 For the scope of this post, we’re going to highlight the states where we have clients (Accounts). Once we have the connection to Dynamics CRM established, we are presented with the Navigator. 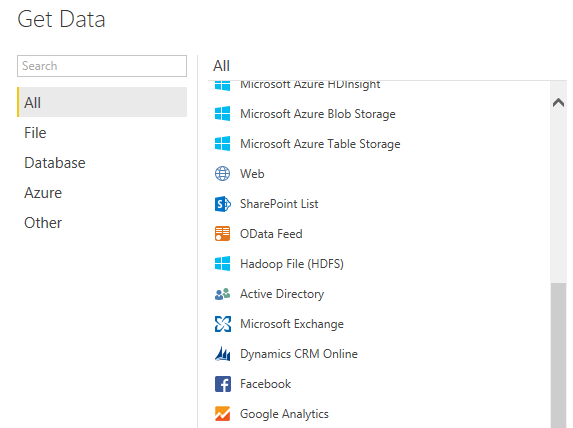 Here we can select the data from Dynamics CRM that we want to work with. I’ll be selecting here the AccountSet. You will get a truncated view of the data for preview. Select Load. Note that this is not the fastest kid on the block, so wait for a moment while all your data loads. Depending on the data set, this could take a while. Once loaded, your data set will appear in the Fields area, on the right hand side. If you want to make your query leaner, you could edit the properties and remove the columns you don’t need, but we’ll be looking at advanced query configuration some other time. Now is probably a good time to check and make sure that your Accounts in CRM have Latitude and Longitude. Geo-mapping an address is not something you can turn on out of the box, so you will have to either customize the functionality to map an address to it’s coordinates, or use a 3rd party solution that does that. Next select the icon that looks like a map, and click it. A map representation shows on the page. 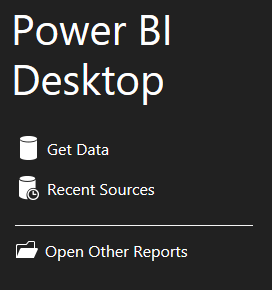 Click on the Data icon on the left side. 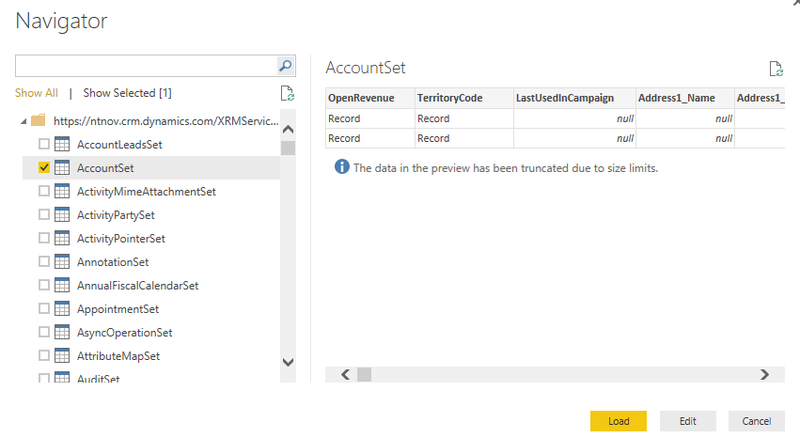 Here you get a view of the data from CRM, and the ability to customize each field’s properties. Select each of the mapping fields and from the Properties ribbon area define the Data Category for each. 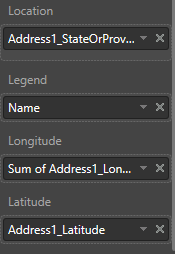 For example, select the Address1_Longitude field and select Longitude in the Data Category. Do the same for Latitude and the address fields as needed. Now go back to the Report view and in the Visualization Fields wells start dropping the values you need as depicted below. You can tweak the settings as needed. When satisfied, save and publish your report. Yes, I have to say it, I don’t build charts too often. And because of that, sometimes it’s hard to remember how did I do it last time. Stacked charts is one of those examples. It’s been a few months since the last time I built one, and I just got asked a few questions that sent be back scrambling to figure out how to do it. First off, what are stacked charts? A stacked chart, looking like the image below, is a representation of parts in a whole. Very generically stated. The chart describes the cases by origin for each day. So, the whole is the day, while the parts are the case origins. This could have been a single bar for the current day, or a set of bars for multiple days like the example shown. So, now that we see the purpose, what available options do we have for representation? Starting with the previous article HERE, we can adjust colors, labels, and other properties of the chart by modifying the XML. But let’s leave that as a last option, and look first at what we can do out of the box. The example presented above shows a simple stacked chart. We can actually modify it to make it into a 100% Stacked Column chart. 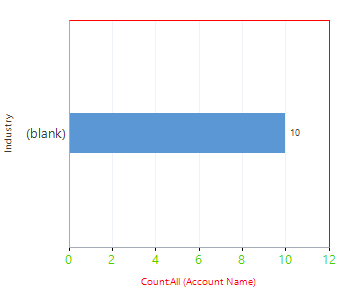 That is very easy to achieve by going to the chart properties, and changing the type of chart to 100% Stacked Column. NOTE: You can not modify a default chart, you have to save it as new and then modify it. The end result will look like the above screenshot. Of course, make sure that it makes sense to represent the data as such. Cool, eh? Now go ahead and stack’em high. 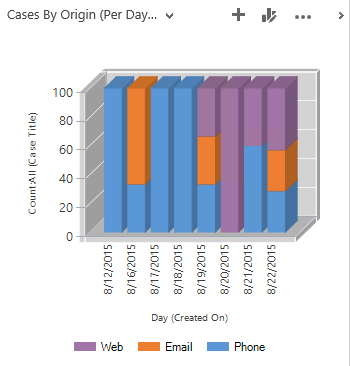 Creating new Charts in Dynamics CRM has been quite easy for a few versions now. It’s a visual process, very intuitive. But how is all this configuration stored? To have a quick look at this information, we can start by selecting a chart to analyze. Let’s navigate to Sales > Accounts. Expand the chart in the My Active Accounts view on the right side. 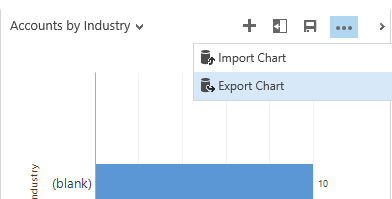 Then click on the ellipsis (More Commands) and on Export Chart. The output is an xml definition file. Let’s look at some of the elements. Wrapper – the entire customization is wrapped in a <visualization> tag. 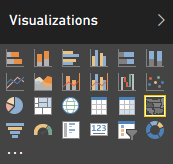 Inside, the specific chart ID is defined in a <visualizationid> tag. This recognizes if this is a new chart or n update to an existing one. Do note that you can not override the OOTB charts. Next we have the respective <name> and <description> tags which are pretty self-explanatory. The <primaryentitytypecode> tag defines the entity for which this chart is available. In our case it will be for account. All the way at the bottom of the file we have the <isdefault> tag which simply defines the Chart as the default or non-default chart for this entity. Values are true or false. The <datadescription> tag contain the <datadefinition> tag, which in turn contains the <fetchcollection> and <categorycollection> tags. The <fetchcollection> contains the <fetch> tag which describes the query used to retrieve the data. 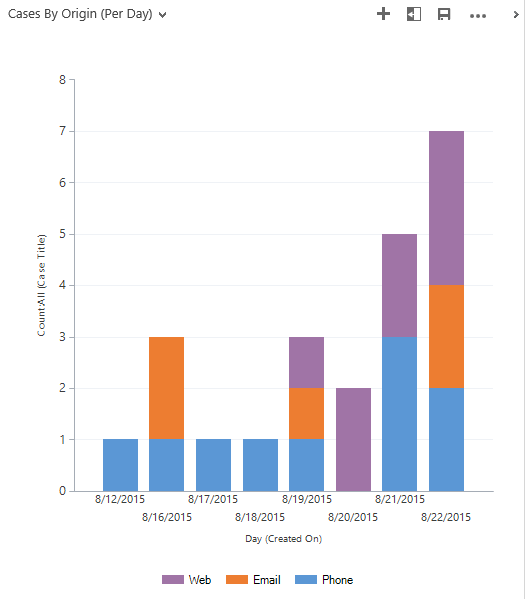 This uses standard FetchXML to retrieve data for the chart. The <entity> tag defines the entity queries, while the <attribute> tags define the properties. The <categorycollection> tag defines the category and series. These are basically the horizontal and vertical axes of the chart. The <category> sub-tag contains for each defined category a <measurecollection> which maps to a series element. 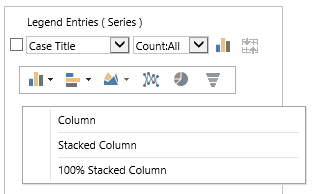 For a single series chart we will only find a single <measurecollection> tag, while a multi-series chart will have more than one. The <measure> tag inside the <measurecollection> is just referencing the vertical axis value (series) which correspond to each element on the horizontal axis. The <series> tag which defines the chart type, labels visibility, colors and font size. The <chartareas> tag which defines the chart border properties and the X and Y axis properties. The <titles> tag which defines the title font, alignment and color. The xml of the <chart> tag is a serialization of the Microsoft Chart Controls Chart class. 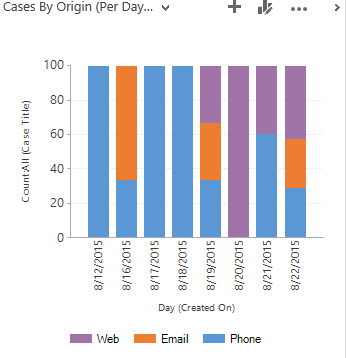 For the standard features of the Chart Controls see this article on MSDN. Not the most visually appealing, but proves the point. Now you can go ahead and “brand” your Charts. When modifying colors, use the RGB notation.